The strikingly simple silhouette and the sophisticated materials implemented add a touch of elegance to any setting thanks also to the design whereby geometric shapes have a very strong impact. Fard is a family of coffee tables can cohabit perfectly to make up original compositions or be picked individually to furnish a particular room. 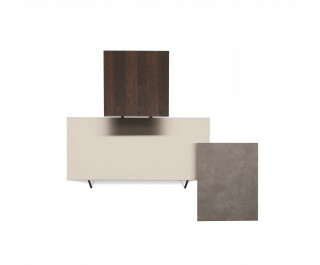 They feature a base made of matt painted metal and a wooden table top with a biomalta finish or heat-treated oak finish. The coffee tables are available in a variety of heights and sizes. Fard coffee tables guarantee total freedom of choice when designing a particular room, as well as ample customisation possibilities. They can be used stand-alone or combined as a set.